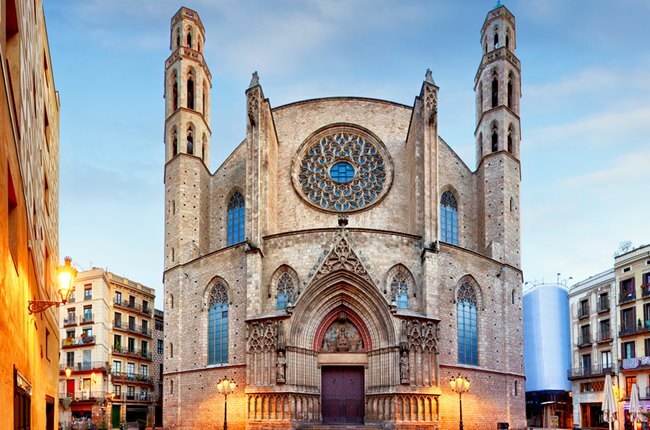 The Santa Maria del Mar, also known as the “cathedral of La Ribera” was built between 1329 and 1384 and is the only surviving church in the pure Catalan Gothic style. The church was built using a geometric composition that was significantly used throughout the entire Gothic period, known as “ad quadratum”, which give a building a feeling a lightness. The church also features stained glass windows on the upper level made up of designs by 10 different artists, the Main Altar and the Crypt, and the Holy Sacrament Chapel, designed by the architect Francesc Vila in a neoclassical style.